When looking at how to pay for college, most people look at scholarships, ask their parents, and then take out student loans. And that process typically takes about 10 minutes. 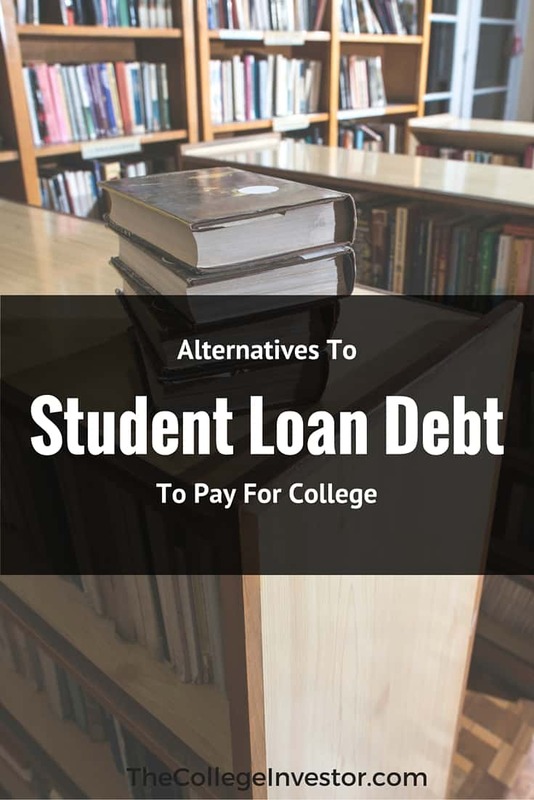 While not much thought is given to the subject, there are several alternatives to student loans that anyone looking at how to pay for college should pay attention to. While student loans aren’t evil, the biggest thing to remember about student loans is that unlike other debt, student loans use future earnings as collateral, so they cannot be discharged in bankruptcy. If you take out a student loan, it must be paid back (for the most part). 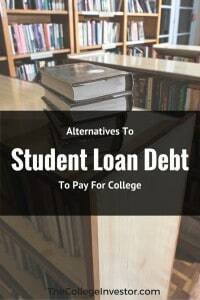 Instead of being complacent in funding your education, consider these alternatives to student loans. The federal government, states and many colleges offer grants for individuals in need. A grant is a form of financial aid that does not need to be paid back. Grants target a variety of student types including students with financial need, minority students, female students, disabled students and students pursuing a certain course of study. Grants do not typically cover the full cost of tuition, but they can be part of a comprehensive student aid package. The most common grant is the Federal Pell Grant, which grants up to $5,815 per student in the 2016-2017 academic year. The author of the blog Femme Frugality used the Pell Grant to fund tuition and some living expenses during her two years of community college, and her husband did the same two years later. In addition to the Pell Grant, The Department of Education updates information about other Federally funded grants that students should consider. Students interested in non federal grants can find information about State specific grants on CollegeScholarships.org, and they can check with their university’s financial aid office to confirm that the office did not miss any grants. Universities use the Student Aid Report from the FAFSA to determine grant eligibility, but applicants may be able to fill out a separate application to apply for further university specific grants. Just 0.3% of students earn full-ride scholarships from their university, but almost all students can win some scholarship money to help offset the cost of college. Students can find scholarship money for anything and everything. Most colleges offer need and merit based scholarships specifically to their student body. Athletes, honors students, and civically involved students should check for scholarships available at their university. However, students who aren’t all star athletes or honors students need not despair. Everyone can find private scholarships through civic organizations, charities, government organizations, businesses, and private individuals. Websites like Fastweb.com and Scholarships.com list hundreds of scholarships that students of give application information for millions of scholarships. Chris Gray used websites like these to apply for as many scholarships as humanly possible. He earned $1.3 Million in scholarship money to attend Drexel University. While in school, Gray started Scholly, a paid scholarship matching service ($2.99 per user) that students can use to find scholarships that will work for them. It’s valuable to view applying for scholarships as a part time job. An applicant who spends 20 hours applying for scholarships and wins $1000 in scholarships has an effective rate of $50 per hour. Scholarships for smaller amounts, and those that require more work offer the greatest chance for return on invested time since these scholarships have smaller applicant pools. Students as young as 13 up to those entering their senior year of college can win new scholarships to offset university expenses. Federal work study offers students a chance to gain work experience while providing an income. Most work study jobs are basic part time job such as working in the dining hall or in the library, but some universities make an effort to give students work experience related to their field of study. In addition to work experience and an income, work study jobs have other financial benefits. Income from work study jobs are subject to federal and state taxes, but this income is exempt from Social Security taxes. Additionally, income from work study programs does not reduce eligibility for financial aid. Working a standard job reduces your aid eligibility by $0.50 for every dollar over $6,400 that you earn in a year, but work study has no such effect. At the graduate level, many students receive a form of work study known as a fellowship. Fellowships cover tuition and sometimes a small salary in exchange for working for a professor or an academic department as a teaching or research assistant. Funding for fellowships comes from grant money provided by national or university endowments and is managed by the professors within a given academic department. Robert Rounds, a doctoral candidate in Materials Science at North Carolina State University, explained that his funding is tied to a grant that his advisor received from the United States Department of Defense. The grant provides enough money for him and five other students to receive free tuition and a stipend. However, his advisor periodically asks him and the other students to apply for fellowships through the National Science Foundation. Earning one of these fellowships is considered prestigious and it would allow his advisor to stretch his grant for a few more years. Graduate and undergraduate students who receive fellowship money should maintain clear communication with their advisors to be sure that fellowship money will be available for the entire course of their studies. Many students forgo work to focus on their studies, but working while attending school teaches practical business and time management skills that every person needs to learn. Many employers offer jobs with flexible schedules that allow students to work and attend school simultaneously. Working for traditional employers has a few drawbacks relative to work study programs (you must pay Social Security taxes and earnings over $6400 reduces your federal financial aid eligibility), but its advantages often outweigh these drawbacks. For example, many students will find that they can earn a higher hourly wage working for themselves or for an outside employer than they can through the Federal Work Study program. Additionally, it’s possible for students to find paid work related to their intended career field, and the connections that students make from these jobs can lead to better job prospects upon graduation. Shannon McLay, host of the Martinis and Your Money Podcast believes that working at Best Buy during school helped her stand out from other applicants when she interviewed for finance jobs after college. Working as a cashier also allowed her to keep student and consumer debt to a minimum. Working while in school is one of the best ways to pay for living expenses and tuition and to keep debt at bay. Many colleges and universities want to give everyone a chance at an education, so these schools work with the individuals to create payment plans (also called tuition installment plans) that allow students to spread out a tuition gap over the course of the semester or academic year. For example, if a student has a shortfall of $3,000, their school’s financial aid may allow them to spread out payment over the course of 10 months ($300 per month). Most payment plans do not charge interest, but they do have penalties for falling behind on payments. Before choosing a payment plan, it’s important to check if the school charges interest or fees (especially for late or incomplete payment). More innovative payment plans called income share agreements have cropped up at a few major universities. For example, Purdue University started a “Back a Boiler” income share agreement that lends money to students who agree to pay back a set percentage of their salaries (up to 3.97%) for nine years (with a cap on how much a student might have to pay back). If the full amount granted isn’t paid back after nine years payment still terminates at that time. Income Share Agreements benefits those who expect to be low earners post graduation, but high earners come out behind. It’s important for students to seek out alternatives to student loans before resorting to borrowing. Even if the alternative measures don’t cover the full cost of tuition and living expenses, they will reduce the amount you have to borrow in the end. Readers, do you know of any other alternatives to students loans? I think the best alternative to a student loan is one’s parents saving money for kids education. It’s often very hard to do, particularly with multiple kids. Believe me, I know this very well! That said, while out of the kids’ control, it’s certainly good alternative. I know that there’s much responsibility to be learned by financing one’s education, but I’d really like my kids to have to focus on other things when the time comes. I don’t know how realistic that is for me to say at this point, but that’s the goal! That’s a good hope, but like you said, it really is out of the student’s control. I went the live at home, and work option. It worked for me just fine. Did I go to some prestigious school out of state? No. But I went to college, graduated with the degree I wanted, am debt free and have a great job. People CAN do it, a lot of them don’t want to. I am not sure Obama agrees with your view that student loans need to be paid back. Apparently, this rule no longer applies…. There’s always the night school alternative which is very prevalent with the master degree seekers. And some companies still reimburse you for part or all of the education costs. For teaching degrees, some school districts will cover the costs if you sign on to work a school for a fixed amount of time. It’s hard to stomach spending so much on school now, but hard to decide not to with competition so fierce in the job market. These tips really help! If the student is going to work, one consideration might be to take a year off before college and work for the college they plan on attending. There is almost always a tuition discount for university employees. I think state school is the best bang for your buck. Most U of STATE are fantastic programs, and there are public technical schools in many states. Parents should definitely help put loans in perspective – I’m cranky about my loans and I didn’t have that much – I always thought the $20k would be no big deal. I can’t imagine $100k+! Yes, state programs are a great way to go. So much savings for a great education.